Doris Dumrauf is an award-winning bird photographer and public speaker. She is the author of two nature picture books and has published numerous photo features in magazines and newspapers. Doris finds many photo objects in her own yard, a National Wildlife Federation Certified Wildlife Habitat®. She lives in western Pennsylvania with her husband, two indoor cats, and a garden full of amazing wildlife. 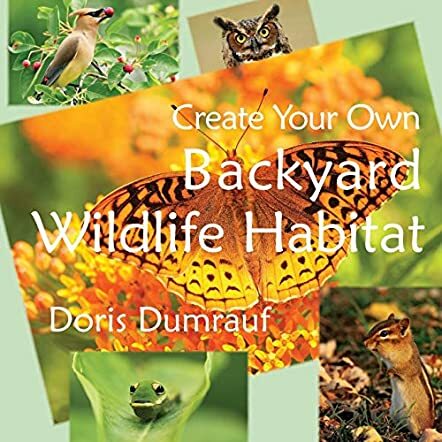 Author and photographer Doris Dumrauf has created a backyard oasis and chosen plants and water treatments to attract a variety of birds, dragonflies, frogs, and more. Her stunning, full-color photos provide the visual evidence of visitors to her backyard. Now, she shares her secrets to Create Your Own Backyard Wildlife Habitat. She lets the birds do the storytelling. They describe what they like to eat so that you can consider what flowering shrubs or fruit trees you might want to plant to encourage visitors to your yard. For example, if you want monarch butterflies to visit your yard, plant milkweed, asters, goldenrod, and zinnias. The book goes into more detail. Create Your Own Backyard Wildlife Habitat is a must-have book for school, home, or public libraries. Young and adult readers will find this picture book interesting and informative. The vivid, close-up images of caterpillars, butterflies, birds, and other creatures help readers identify the visitors and then Dumrauf describes their habitat, eating habits, social nature, and life cycle. The photos are so vivid and sharp you can see each vein on the wings of the Painted Skimmer Dragonfly or each hair on the bee. At the back of the book, Dumrauf provides tips on how to start and maintain your own habitat such as providing fresh water for drinking or bathing but change the water regularly to avoid mosquitoes. If you want monarch butterflies, plant milkweed so they can lay their eggs. If you want to enjoy watching birds, butterflies, squirrels, and other wildlife in your backyard sanctuary, you’ll enjoy reading Create Your Own Backyard Wildlife and benefiting from the advice provided.